The first explanation of Migatte no Gokui aka Ultra Instinct came from Whis in three different sources - Episode 18 of the anime, Chapter 2 of the Revival of F (RoF) manga, and the RoF movie. Whis is talking about the time it takes for information from the external environment (senses) to be processed through the brain, then think about an action, and then send a signal to the body to perform that action. 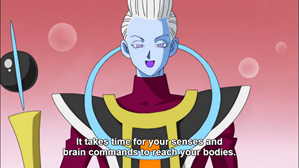 Note that Whis says 5 senses which is most likely referring to sight, sound, smell, taste, and touch. These are colloquial in neuroscience. There are other senses beyond these 5 like hunger, thirst, etc. but those are internal senses not external. Other external senses like vibration, proprioception, temperature, etc. are part of touch. Then of course, in the world of DB, there's ki as a sixth sense. That's a lot of time wasted if you think about it. Even if we eliminate the time it takes from thought to action (the hesitation or thinking of what move), it's still a lot of time. For example, to dodge a punch, you either see the punch or feel it or hear it, etc.. Then, a decision has to be made how to deal with this punch - block, dodge, parry, counter, etc. All this time thinking and processing in the brain is time that is wasted. However, even if you reduce all this time to 0, there is also the time it takes for a signal to travel from the brain to the muscle. Want to know how fast that actually is? The average time it takes for this to happen is about 25-35 ms to the upper extremity and 40-50 ms to the lower extremity. However, if fighters are throwing punches and kicks at faster-than-light (FTL) speeds, 20-50 ms is way too long of a time to dodge. In reality, our brain sends a signal to our spinal cord which sends a signal through a nerve to a muscle to move a specific part of our body. These times have been measured and it has been reproduceable in several studies that are published today in peer-reviewed journals. We can stimulate regions of the brain using transcranial magnetic stimulation and move specific regions of the body like a thumb or toe. (I do this in my lab in real life.) The time from stimulation to movement is the latency. However, this is not the case for all movements. Sometimes, the spinal cord can send a signal to a muscle directly without the brain. Even the fastest reaction time 5-10 ms, is still too slow! FTL speeds are above 300,000 m/s while the fastest conductance velocity of a nerve measured is about 70-75 m/s. Our nerves are limited by its conductance which is based on the myelin sheath that surrounds it. Think of a wire with electricity flowing inside it. The thickness, length, and the material the wire is made out of all contribute to how fast electrons can move inside of it. For nerves, it's the same thing, so we cannot change the nerves conductance properties. We are born with it! 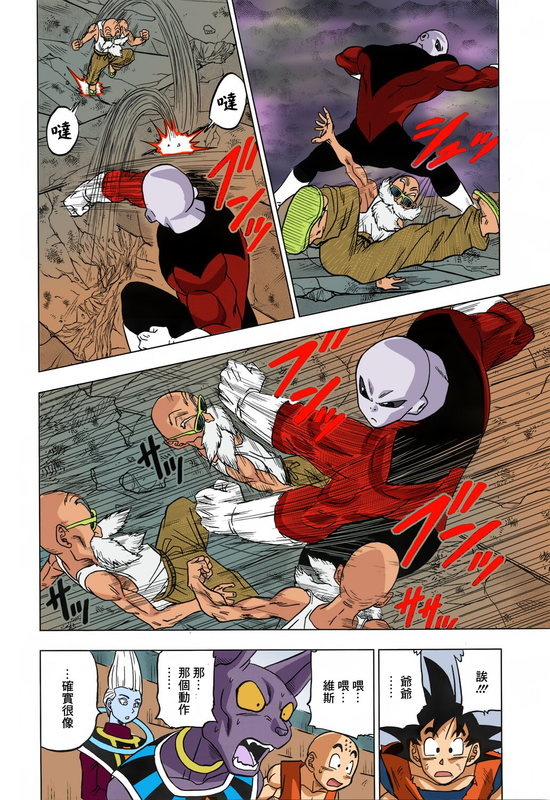 In case you need proof that characters in DBS are FTL, it was told to us in the DBS manga that Jiren can move faster than a spaceship to travel to a planet. The speed of an average spaceship in DB has already been calculated before: http://www.kanzenshuu.com/forum/viewtopic.php?t=25990 Note that all previous assertions that claimed characters were FTL had no proof. It is not until Jiren's statement we had direct infallible proof. Therefore, for the sake of the DB verse which is a fantasy, we have to assume that the delay is actually 0 ms! That is, the body moves by itself instantly with no input from the brain or spinal cord at all! This is what is colloquially known as "muscle memory". In real life, muscles can't store memory. It's our brain that stores it but through repetitive action and practice, we react faster which gives the illusion that the body moves on its own. If we agree to this, this allows any person regardless of their opponent's strength and speed, to dodge any attack because 0 ms will always be faster as it is instantaneous. 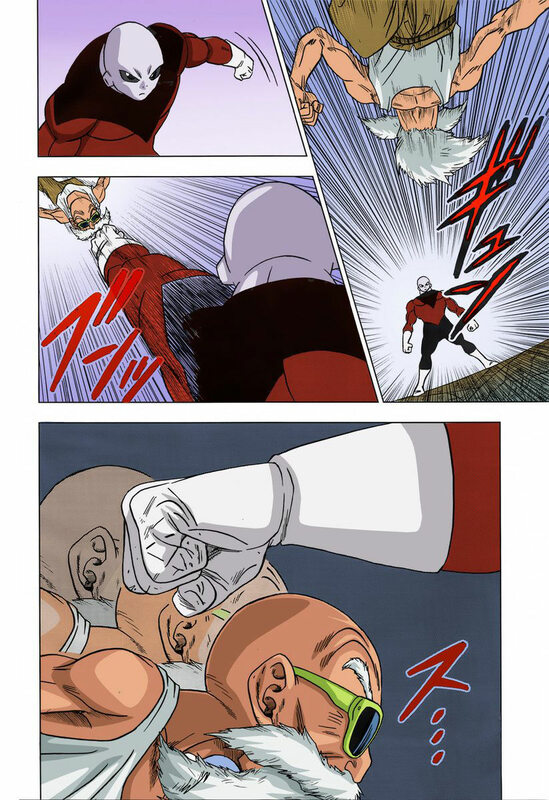 Therefore, a weaker person like Roshi who in Chapter 39 of the manga was shown to dodge Jiren's punches, was still able to do so. Obviously, Roshi wasn't using UI, as Whis said himself, "It's a far cry from UI", but its principles are similar. The whole point of Roshi vs Jiren was to demonstrate the utility of UI and show that it's not just a power or speed boost, but a way of movement. It's a reaction time boost. To give you an example, if Jiren and UI Goku were to race each other in a 100 m dash, Jiren should still win because he's still faster in raw speed. On the contrary, if Jiren and Goku have to press a button when a light turns from red to green, Goku would press it faster because there's no delay for him to react. That is the difference between speed and reaction time. Please do not get them mixed up! Though again, for the sake of the DB verse, which has already shown us that UI is also a speed and power boost, not just a reaction time boost, in all cases, Goku would also win that race against Jiren. While we have said that the delay from thought to action is 0 ms in the DB verse, we didn't say anything with regards to the actual speed of movement in UI. Speed is obviously boosted, but by how much? That is, can someone with enough speed overcome UI? To answer this question, we need to define what is the upper limit of speed in the DB verse. Is it defined? Yes, it is. The upper limit is instantaneous movement and that would be Shunkan Ido. If Goku traveled for example while in UI a distance from planet A to B, that would take x amount of time. However, with Shunkan Ido, it's instantaneous. Therefore, UI does have a limitation in speed by logic. If there were no limitations, then all movements would be instantaneous with no delay. 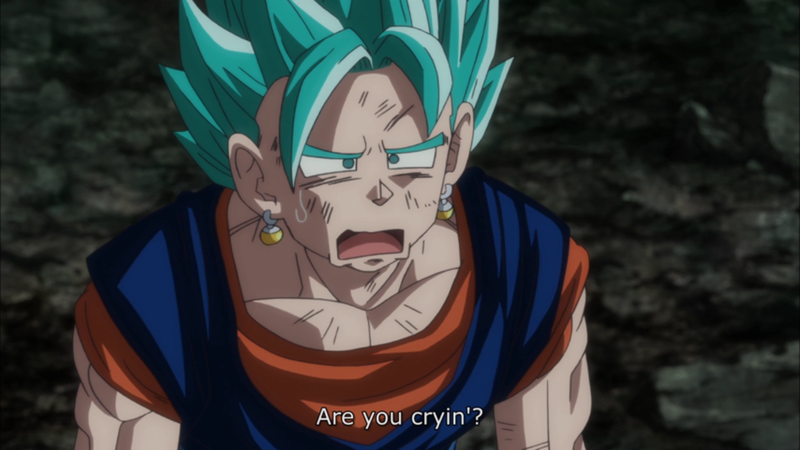 When Whis talks about “It’s because you’re both thinking before you act”. In real life, our brain is always active whether you like it or not; you can't simply remove it from the circuit; it’s part of alive. Even in a coma, there is small electrical activity of the brain. The definition of "thinking" varies but in cognitive psychology, Sigmund Freud defined thinking occurring in three different levels - conscious, subconscious, and unconscious. If we use Sigmund Freud's definition, then it's quite impossible to stop thinking unless the brain is dead. The truth is that we waste too much time deciding what to do consciously that it is faster to react unconsciously. However, unconscious is really where you are knocked out like in coma and the body doesn't move. It is much more likely that ultra instinct occurs at the subconscious level. The reason I say this is because Goku, Beerus, and Whis are still shown to be partially conscious and even talking while in UI. Subconscious allows you to still be partially awake. 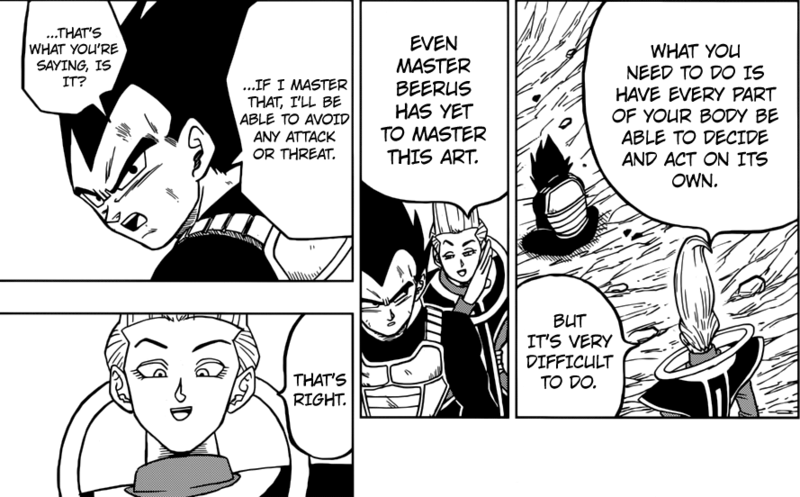 In fact, in Chapter 39 of the manga, Whis confirms that it is the subconscioius state so this theory is confirmed! Sleepwalking and dreaming all occur subconsciously. Your dreams are just a manifestation of random memories in the subconscious. Thinking causes a delay and this limits speed. In Naruto, when Rock Lee gets drunk, his reaction speed and movements get faster, why? The alcohol is causing sedation which is limiting is ability to think consciously hence his body is just reacting on its own. It's almost the same thing. This is the basis of what ultra instinct is about why Whis wants Goku and Vegeta to achieve it. In fact, when truth serum (sodium pentothal), is used, the whole concept is to sedate the brain so that it's more difficult for higher cognitive functions. That is, it takes intelligence to formulate a lie. Sodium pentothal is a barbituate and slows the conduction velocity of action potentials, so it's harder to think complex problems. So it's easier to just say the truth. In the same way, if a person isn't thinking too much about what their next move will be in a fight, they'll instantly move without hesitation, making their reaction times faster. So if we still need the brain, can we reduce reaction time and still teach our body and muscles to react on their own? You can, by practicing a specific response to a specific stimulus over and over. This is what is done in martial arts where a single move is practiced thousands of times, even if that move is simple – until that move is natural. This state of mind in martial arts is known as Mushin. The reason this works is that the brain is forming synapses between neurons and hard-wiring this specific movement. Normally, the first time you learn something, the brain sends a signal between neurons, but the strength of the connection between neurons is weak. The more you do it, the stronger that connection becomes until it is natural. This is how memory is encoded in our brain. The notion of “muscle memory” is false. The muscles themselves do not contain any memory, your brain does. However, the term developed because through practice, reaction time was faster which gave the illusion that one is not thinking and just reacting. You’re still thinking as the brain still needs to send a signal to your muscles to move. The only difference is that it’s subconscious and your body will react on its own without you consciously having to give it instructions to do so. The brain is still involved. It's no wonder that Bruce Lee said, "I fear not the man who has practiced 10,000 kicks once, but I fear the man who has practiced one kick 10,000 times." Ok, so that explains the "defensive" portion of UI where a fighter can continually dodge any attack. What about the "offensive" portion? This is where we need to discuss the "heat". A blue energy surrounded Goku and Whis calls this "heat". Heat in science is just kinetic energy. Hence, in this case, it would be the kinetic energy that is generated from moving instinctively while in UI. When Goku closes his eyes, that is when he relies less on thoughts and thus, he moves more instinctively, accumulating more heat. Eventually, he has enough to form the shape of a galaxy. He then absorbs this energy to get Mastered UI (MUI). This DID result in an increase in power for Goku, not just faster reaction time. This allowed Goku to also boost his offense. Additionally, with the aid of dodging any attack, Goku can now land any hit at any location, leading to critical strikes. He did this in the anime against Kefla, by Kamehameha surfing, dodging all of Kefla's attack and landing a critical hit to Kefla's face. Note, however, this concept of heat only exists in the anime and not in the manga. Whis has already shown to use ultra instinct when he was sparring with Goku and Vegeta, instinctively dodging and blocking their attacks without even looking at them. Beerus in the manga was shown to also do this though he hasn’t fully mastered it. Neither Whis nor Beerus had any indication of a transformation or physical changes. For Goku, there are distinct physical changes seen like silver eyes and the aura called “heat”. Initially, we had thought that these physical changes were a result of absorbing the Spirit Bomb but then they were seen again. These physical changes may be exclusive to saiyans or it is the author's way of depicting to the audience that he's using ultra instinct. Then, as Goku achieved MUI, Beerus stated, "That form, that glow". This is when all the Hakaishin stood up. It can be assumed then, that MUI does indeed have physical changes with with a unique aura that can be manifested even if a non-Saiyan achieves it. That is, the full form of UI, does have "That form, that glow", a physical change, so it doesn't mean we have seen Whis or Beerus use their MUIs. 1. What if two people with MUI fight each other? What would be the result? A: Assuming each person has the same power and speed, they can continuously dodge the other person's attacks. Hence, the person who runs out of stamina first would lose the fight. Another possible scenario would be in which a person is unable to dodge because they are put in a certain position such as Freeza's "Imprisonment Ball". 2. What if Hit used Time Lag against an opponent with MUI? Can the person with MUI still dodge? A: The person affected by Time Lag and that has MUI, will be able to still instantly react to an incoming attack and begin to dodge it instantaneously. However, their body movement has been impeded by the Time Lag. So it would depend on the speed of the body and the speed of the attack. It also depends on the distance needed to travel for the attack to land a hit. The arm span (length from hand to the other hand measured across the chest), is usually equal to a person's height. Let's say a person is 6 feet (1.8 m) tall and wears a L size T-shirt so the chest width is 52-56 cm. Let's assume it's 55 cm or .55 m. Then the length of their arm is (1.8-.55)/2=62.5 cm. Let's also say the hands are held in front of the face about 5 cm. This means that a punch has to travel about 62.5 - 5 cm = 57.5 cm to hit your opponent if you are standing close enough and your arm is stretched out completely. Let's say the speed of this punch is light speed so 300,000 m/s. This means it would take 0.575/300,000 = 0.0000019 s or 1.9 us (micro seconds) to hit the target. If this punch is aimed at the center of the face, then their head just has to move a little bit more than half the width of the head. Facial width varies but let's say the average is about 12 cm. This means they have to move about 8 cm either left or right to dodge the punch. They can also move up or down and then that would depend on the facial height. They can also move diagonally. Anyways, let's just do left to be simple. He has to move 8 cm BEFORE 1.9 us. That's a speed of 0.08/1.9E-6 = 42105.2 m/s. He has to be faster hence than 42,105.2 m/s to dodge that punch! That's a lot lower than 300,000 m/s which is the speed of light! That's basically showing us that a person with MUI has faster reaction speed and hence, does not need more speed than their opponent to dodge. If Time Lag were to lower this speed by half, then he can still dodge as long as his speed is more than 2x 42,105.2 = 84,210.4 m/s. So yea, MUI is not a free ticket to dodge any attack. It also depends on the body's speed as well and their opponent's speed. It's even possible to have an opponent's speed so high that it overcomes the ability of the MUI user to dodge even if they can react instantaneously. Last edited by shadowfox87 on Wed Apr 10, 2019 9:01 am, edited 36 times in total. Its basically Bruce Lee's theory of self movement in combat. You train your body to react but not think and in the process you just either "expand" or "contract" when your opponent performs vice-versa, sometimes in a completely unexpected manner. Its a staple of martial arts that has always been a part of the philosophy of self defense, I'm kinda surprised its taken DB this long to finally open up on something that was Bruce's books made public nearly a decade before DB came out. I guess Toriyama may have been holding out on the concept for awhile, possibly because he couldn't figure out a way to have his characters fight in a purely technical fashion as opposed to raw power? I kinda suspect that Ultra Instinct in Goku's case is indeed a power up though, Toriyama has always been bare bones about his characters progressing in power which is the theme of DB. Goku will still find a way to swell up his Ki to greater heights and Ultra Instinct is the perfect excuse to do so, the Oracle Fish even said that Goku & Vegeta will rival Beerus someday. If Ultra Instinct is indeed a state of mind however then its likely that it won't stay as such in the future if Toriyama's writing is anything to go by. theherodjl wrote: Its basically Bruce Lee's theory of self movement in combat. You train your body to react but not think and in the process you just either "expand" or "contract" when your opponent performs vice-versa, sometimes in a completely unexpected manner. Its a staple of martial arts that has always been a part of the philosophy of self defense, I'm kinda surprised its taken DB this long to finally open up on something that was Bruce's books made public nearly a decade before DB came out. I guess Toriyama may have been holding out on the concept for awhile, possibly because he couldn't figure out a way to have his characters fight in a purely technical fashion as opposed to raw power? Yes, Mushin, has been part of martial arts for a long time. The process of how it works neurologically however has alluded a lot of people. Akira Toriyama has the power to make Ultra Instinct a power up if he wants, but I hope he will not. If it is a power up, then I think it's similar to the Ultimate Gohan where his latent potential is brought out in his base but the primary purpose behind UI should still be instinctively moving. I made a thread for discussing this on the Super board. I think we can add just a tad bit more to this. 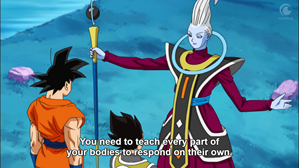 Whis not only taught them this, but ALSO to control their Ki and prevent it from seeping out of their bodies and raise it when attacking. 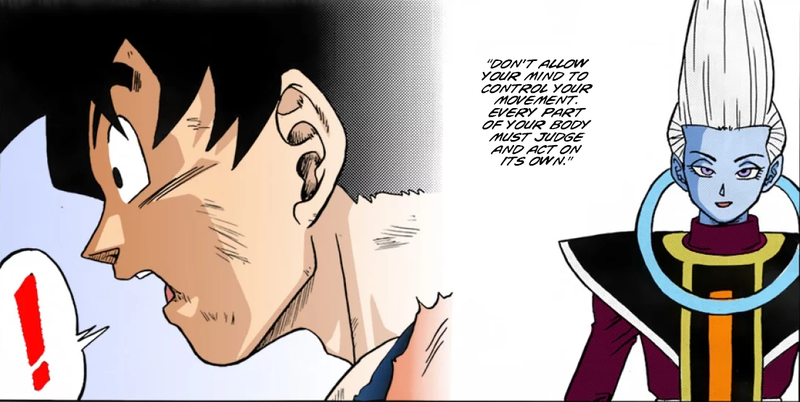 Everyone's Ki is unique to them; one can even tell one's nature as a good or evil being from sensing it. It could be that, just like the body, one's Ki flows through their body without intention, only by fully realized instinct, when making use of the Ultra Instinct power. So, the reason that Goku wasn't able to hit with as much force as he liked was because he was specifically trying to attack, thus limiting the way in which his Ki can instinctually travel through his body to maximize damage. This COMBINED with the precision and skillful landing of blows when going on the offensive with the Ultra Instinct would be an effective way to explain why someone who's mastered this technique is so dangerous and feared even by the gods. Their body moves so fast and skillfully, and they can channel full force into their blows so as to get past Ki defenses and hit with the greatest amount of damage. There's no thanks button unfortunately in this forums, so thanks! PerhapsTheOtherOne wrote: I made a thread for discussing this on the Super board. Yea, I just rather have it in the in-universe section since the Super section is bombarded with episode reviews. You have also a good theory there. The nature of the ki can definitely be sensed because I believe that ki also represents spiritual energy. Having negative thoughts would affect the spirit. The magnitude of the ki however wouldn't change. I guess it's like Star Wars where a jedi can be light or dark but the quantity of their force is determined by the midi-chlorians. I believe that Whis taught them ki control to more effectively fight and not consume their ki. In the manga, Goku uses Completed SSB where he completely controls his ki in SSB allowing him to fight even Merged Zamasu almost equally. You could say that in Ultra Instinct, their is unconscious control of ki allowing him to use a lot of ki even in his base form without transforming into a Super Saiyan. In short; don't think, just do. A bit of an oversimplification, but yeah. You get your body use to doing the movements for the techniques to where it becomes as natural as breathing. Jackalope89 wrote: In short; don't think, just do. Well, the point of my explanation is that you're still thinking. You can't just eliminate thinking altogether; it's part of being alive. Breathing is involuntary and is controlled by the autonomic nervous system. Moving your arms and legs to throw punches and kicks, is voluntary and controlled by the somatic nervous system - it requires thought. Doing it over and over though, makes it more natural and that reaction time is less. Well, the exact science likely doesn't follow that exactly, going for the more mystical interpretation of it. In line with my previous comment, it could be that one's Ki is the thing moving their body, thus removing even the little caveat you yourself just highlighted. In a sense, the muscle DOES have memory. We have to remember that Goku's moves were nothing like they ordinarily were, even though it would logically merely be enhanced moves in terms of reflex speed for him. Instead, his body takes on a mind of its own, something we see when he looks down at his hands after his body goes on the offensive against Jiren when the Ultra Instinct is first demonstrated. It's more like he's possessed by a supernatural force than he is merely enhancing his reflexes. But if it was his own Ki moving his body? That'd explain why his moves are so unnatural, so uncharacteristic of the way he normally fights. PerhapsTheOtherOne wrote: Well, the exact science likely doesn't follow that exactly, going for the more mystical interpretation of it. If you want to go by the theory that in the DBverse, muscles have memory, it just simply means that he's developed his own spinal reflexes. The memory is still not stored in the muscles itself. Essentially his spinal cord is doing the work rather than his brain. It doesn't mean that his ki is moving his body. Ki is energy and doesn't have a mind of its own. In martial arts, a move can be practiced over and over until it is natural giving the illusion of "muscle memory". As for the part where Goku was looking at his own hands and was surprised as to how his own body is reacting without him being aware of it - that can still be made sense of as unconscious movement. The brain is still sending signals to these muscles to move, but it is involuntary. 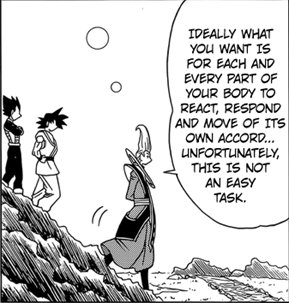 Making it involuntary makes it faster because Goku does not have to waste time making decisions as to what to move and when. It's not involuntary like breathing though. Goku can still control his own body but the body will also move on its own at the same time. The only way to bypass the brain completely is via spinal reflexes like the knee-jerk reflex. Normally, spinal reflexes are based on biology and you can't simply create new spinal reflexes, but in the DBverse maybe you can. I'd still rather go for the scientific explanation as much as possible to make sense of something. We can simply say everything is magic but more often, magic is science that hasn't been understood yet. I've been thinking about your explanation, and I've decided that I disagree. First of all, let me make sure I am understanding you right. You're saying that no matter what, stimuli has to be received through the senses, and the senses have to transmit that to the brain, before the brain can send messages back to the body telling it what to do. In that sense, thinking still has to occur even during Ultra Instinct, if we are saying that electrical signals going from the brain to the body counts as thinking. Body parts can not move on their own, muscle memory is a misnomer, muscles can not have their own memory, in order for an arm to move and throw a punch, it has to be commanded by the brain first, and therefore, thinking is always occurring. That's what you are saying, right? I was thinking, if all Ultra Instinct is, is shortening the time it takes for signals to go back and forth between the brain and body, then that's... really underwhelming. Like you said, regular people do that in real life. theherodjl said that Bruce Lee wrote a book on this. I have to imagine Ultra Instinct is something else, something more worthy of the Angels, not just a suped-up version of a relatively basic tenant of martial arts. So you're basing all of this on the fact that only spinal reflexes can exist without input from the brain, but fighting is too complex to be made up of spinal reflexes, choosing to parry a punch and then counterstrike HAS to be dictated by the brain. Like you said, muscles can not have their own memory, your arm can not throw a punch on its own. ...But isn't that why Whis said, the goal is for each and every part of your body to move and react independently? Like when he's parrying all of Goku and Vegeta's strikes without looking, that shows his arms are moving completely on their own, there's no input from his brain there because he's not even looking. 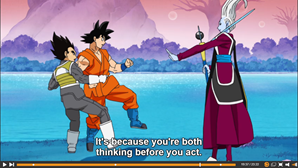 When Whis said they need to move without thinking, I do believe he meant that literally, because even if it's illogical in real life, something like that would be the next step for Goku in his mystical supernormal martial arts training. 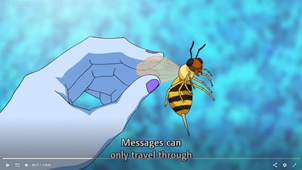 The way Whis described it and the way he moved doesn't seem to me like he simply has a really short delay between his brain receiving a message and then sending back out a message. No, the way he parried all their strikes from both sides at once without looking at either, tells me he wasn't thinking at all. It was completely effortless. It is one of the few powers in the series that does have a basis in real life science. nickzambuto wrote: I've been thinking about your explanation, and I've decided that I disagree. No, that's not what I said. The brain can send signals to your muscles without a sensory component. Your nervous system has a sensory and motor pathway. Sensory means your body is receiving information from the outside world - the 5 senses. Motor is the movement of the body. The brain is involved always unless it is a spinal reflex. If it is a spinal reflex, then your spinal cord can move the muscles without the brain. The problem is you cannot train your body to form new spinal reflexes. You are born with the same spinal reflexes that everyone else has. Just because it is underwhelming, does not make it any less true. It is still quite cool. Instinct is how we work, but Ultra Instinct is on a new level in the DBverse because it is unconscious self-movement. We have seen this in real life but not to the degree used in the DBverse. It depends on your definition of "thinking". If thinking means to you that I tell my body what to do, then no. That's not what I'm saying. Self-movement is unconscious movement which means that I'm not actively telling my body want to do voluntarily. Instead, the body is reacting on its own without me being aware of it. My point was that the brain is always involved, that there is no such thing as "muscle memory". The time that is saved is Goku not wasting time to make a decision to move, rather his body moves on its own. You can say that's without thinking and say that the brain is still sending signals but it is unconscious. This is the entire reason people made up "muscle memory" because it gives the illusion that something is "effortless". In fact, memory is in the brain not the muscles and the brain is making the effort to move. Practicing a move thousands of times creates the synapses in the brain to allow to do this to give the appearance that something is effortless. However, to play the Devil's Advocate to that, Whis makes the point that the parts of the body must be trained to move without ANY kind of signal from the brain because it's too slow. PerhapsTheOtherOne wrote: However, to play the Devil's Advocate to that, Whis makes the point that the parts of the body must be trained to move without ANY kind of signal from the brain because it's too slow. Well, actually I have the quote for what Whis said above from the anime, manga, and the movie. He talks about how the brain can send signals to the body only so fast. He never said to move without any signal from the brain because quite literally, it would be impossible for the body to receive information about its surroundings without the brain. The body needs to know the direction of an opponent's punch to dodge it. The 5 senses give that information to the brain. If you take out the brain from the circuit, it's impossible. Spinal reflexes are the only way and those are fixed. Bypassing the brain and making the spinal cord do the work only saves about 10 ms. I'm quite sure that if you remove the 5 senses from Goku, his ultra instinct would be severely weakened. Take a Goku who is blind, deaf, anosmic, and third degree burns all over his skin. All he's left with now is sense of ki. If the fighter is suppressing the ki or has no ki like the Androids, ultra instinct wouldn't work. See, that's where I and others disagree. The ability to even produce Ki from one's Genki should be impossible if we base things ENTIRELY on real-life principles. I'm not saying you don't have the right idea, just that you may be taking it to too much of a logical extreme that the show itself would likely never stoop to. The quote itself specifically talks about how slow the speed is of the brain sending signals to the rest of the body, that the different parts of the body themselves are what need to be trained to move independently. Applying the exact real-life biology likely isn't what's being factored in when Toriyama first introduced the idea into his franchise's world. And if the parts of the body themselves are what are being trained to react without any input from the brain, then the senses aren't necessarily gonna be needed to determine things. For example, at the speeds at which everyone in the show fights at, there shouldn't be any sound or the perception of it whatsoever. Yet they can still perceive sound because that's one of the caveats that's accepted for the sake of the show's own consistency. It could very easily be that the Ultra Instinct has similar caveats. PerhapsTheOtherOne wrote: See, that's where I and others disagree. You are free to disagree. Everyone has a right to their own opinion. I like to use real world science to explain phenomenon seen in anime, comics, and tv shows as much as I can without contradicting the original author. So far, I haven't said anything that contradicts what Whis or Akira Toriyama has said. Also, vibration sense is part of the touch pathway called dorsal column medial lemniscal. They can perceive sound even if they are moving faster than the speed of sound because each time the body makes contact, vibrations are felt. The body is still moving on its own but you cannot take the brain out of the equation because information about the external environment is still needed. If Goku is able to use ultra instinct without sight, sound, smell, or touch, then I can believe your theory in that the brain is not needed. Instinct is dependent on the other 5 senses to predict and respond to a future outcome based on current information. It's not an independent sense. So, I reanalyzed some quotes. Whis makes note of not only signals from the brain, but ALSO the senses themselves reaching the parts of the body. It seems that even the main senses limit just how fast a fighter can be, since wasting time trying to see/hear/feel the opponent can distract you from being able to more effectively fight them. So, I think this is further evidence that points to the Ultra Instinct being a more mystical technique that doesn't rely purely on the science of things. Sure, it's predicated on the real-life principles, but it takes them to an extreme we've come to expect from this franchise by literally removing the need for the brain or the senses. PerhapsTheOtherOne wrote: So, I reanalyzed some quotes. The time it takes for information from the senses to reach the brain is fixed and based on the conductivity of the nerves themselves. Regardless of whether saiyans have different physiology or not, unless the nerves can regenerate or change their conductivity, this speed can never change. Consciously, a person thinks after receiving this information in the senses. 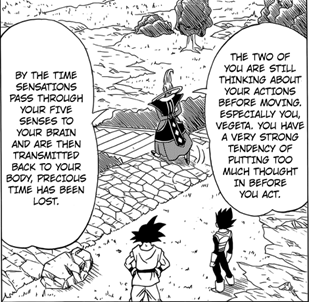 In my opinion, this is the time that Whis is referring to as being wasted as it is also the case in martial arts. Thinking can be unconscious or conscious. Unconsciously, there is little to zero time spent after receiving the information and the brain reacts to this information based on pre-built circuits that have already been built by repetition of movements. That is what ultra instinct is - an unconscious state of mind. The body cannot react to the environment in the absence of senses. The senses are the only way to bring information from outside the body to the brain. Instinct is dependent on these senses. If you remove all the senses, then there's no instinct.